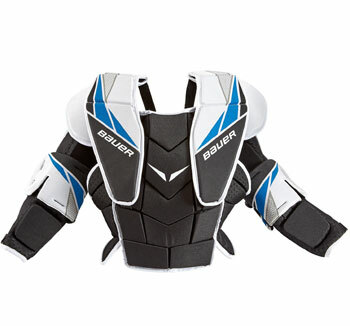 The Bauer Street Goalie Chest Protector allows players to achieve maximum mobility thanks to great segmentation of the protection with elastic nylon straps. There is full chest and arm coverage with medium density foams and extra airflow in the kidneys and arms with perforated low density foam. The interior is line with a brushed nylon to give added comfort and help wick away moisture.